Other people ask me questions. My First Big Hero’s Guide Interview! 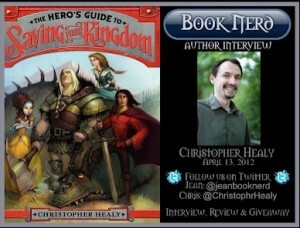 Posted on April 9, 2012 by Mr. H Posted in Hero's Guide, Interviews with Me	. From the Mixed Up Files of Middle-Grade Writers is a wonderful blog the focuses on the vast and rich world of literature that falls between books with a reading level posted on the cover and books with swear words. It’s also the site of my very first interview for The Hero’s Guide to Saving Your Kingdom. In this Q&A, you will learn about my character creation process, hear about my sympathy for witches, and discover the dangers of reading-while-walking.